We return from the holidays with our first dev blog this year. As announced in our roadmap to the finish line, Battle Brothers is about to receive Steam achievements and trading cards. Let’s take a look at both this week while we continue to work hard on the late game crises we’ve talked about last time. Onwards! You may have already spotted some Steam achievements for Battle Brothers popping up over the last few weeks – that’s because we’ve been testing them. There’s currently a total of 70 achievements in the game, although that number may still change slightly in either direction. We wanted the achievements to be a good mix between short and long term challenges, some more serious and some more fun, as well as some rewarding the natural progression as you play the game. Here’s a few examples of different achievements you’ll be able to unlock once the next update is live. Kill 3 enemies with one AoE attack. Kill an enemy with a wardog. Kill an Orc Berserker in melee while high on mushrooms. Kill a Goblin Overseer with a ranged weapon. Uncover 2/3 of the map. Reach day 100 on veteran difficulty or higher. Lose 10 campaigns in Ironman mode. Defeat the Undead Scourge at any difficulty level. 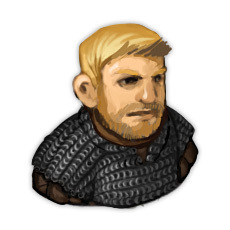 Battle Brothers is also about to receive some Steam trading cards with the upcoming update. 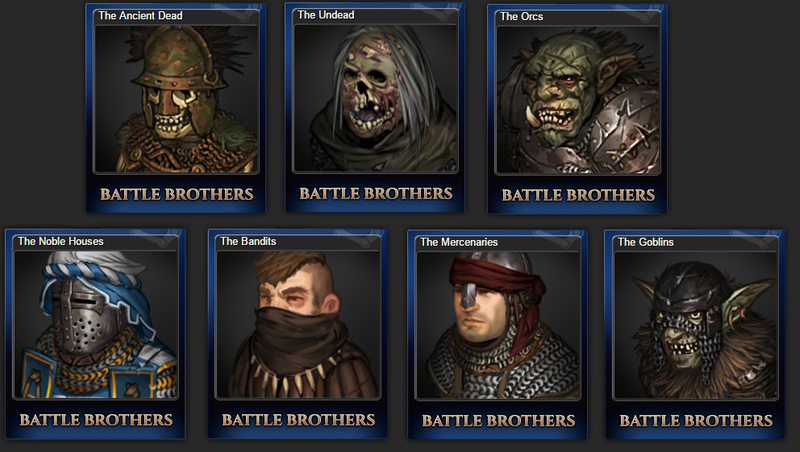 Each trading card is for one of the different types of factions currently in the game – the Mercenaries, the Noble Houses, the Bandits, the Ancient Dead, the Undead, the Goblins and the Orcs. The full-sized trading cards show the faction with their selection of banners and a variety of units with different gear in wallpaper format. Of course, you’ll also be able to unlock badges, profile backgrounds and emoticons. Please make very cool badges. Some games fail at that. Welcome back! Nice to see the dev-blog alive again. Make rare Metal cards for Metal badge! I picked up this game over the holidays and I am suuuuper hooked. Great concept, really looking forward to seeing the execution. p.s. I’m currently working through the Dev Blogs – I’ve never supported an Early Access game before but I’m going to send over my 2nd save game later. Will also report any bugs I notice. This game is worth supporting. Great to hear. Just letting you know that we’re getting your emails, since apparently my replies don’t get through to you. I saw that page already, thank you. I just want to know – are those plans still like that (major new build with endgame cr. etc, then some minor patches fixing the bugs and responding to feedbacks, and then game release – and all of that before summer 2017)? Or the game release may be postponed again? I´d prefer you add mod support instead of stuff like this.